With ever-changing demographics, it is highly likely that your company will find a need to produce bilingual or even a trilingual publication. It is not a matter of just translating the text in a document. It also involves using photographs, color schemes and typefaces that best represent the community. Sensitivity to the cultural differences is very important. In short, a company needs to effectively communicate with the target audience and it is more than likely that the target audience will include speakers from Latin and Central America, the Middle East and Asia. So speaking the language of your audience is crucial to getting your message heard. All campaigns or marketing materials you develop should represent the rich cultural diversity of the regional area, and hence, the targeted demographic market should be well- represented in the photos and text that are used. It is crucial to avoid translating the text word-for-word but rather to use native or long-term speakers of a language to rework the text. They should take into account idiomatic expressions and differences in customs so that the text is easily understandable. 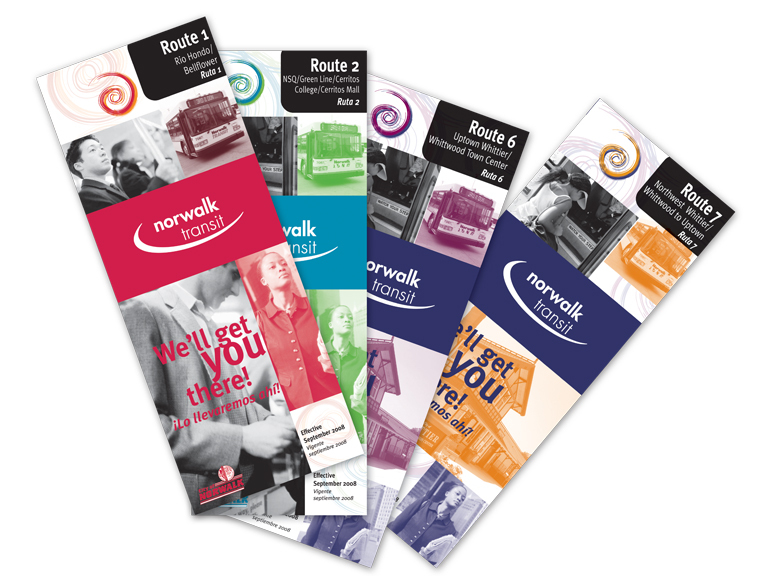 The City of Norwalk hired us to design this very branded set of bilingual bus schedules for the Norwalk Transit System. Each route brochure included English/Spanish bus fare and rider information. The brochures were color-coded for each bus route. Each brochure included photos that show diversity. 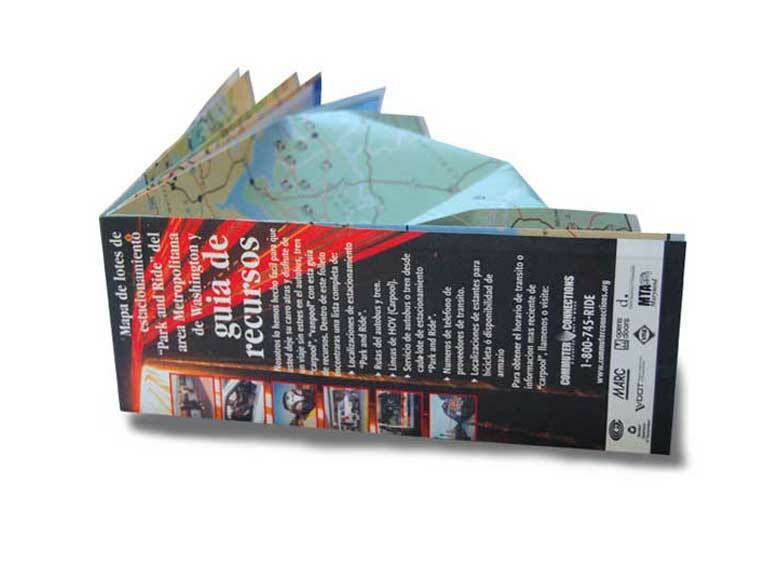 The Metropolitan Washington Council of Governments hired our firm to design a pull-out multi-panel accordion-fold map brochure for Park and Ride lots in the greater Washington D.C. area. This map containdc two covers with one in English and the flip side or back cover in Spanish to help commuters in the Spanish-speaking community. This piece was developed to encourage area commuters to leave their cars at home and enjoy a stress-free commute by using a carpool, vanpool bus or train to get to work. Also in the handy fold-out map was a resource guide that included a complete list of 1) park and ride locations, 2) bus and train routes, 3) carpool lanes, 4) bus and rail services from each park and ride lot, and 5) telephone numbers for transit providers and locations of bicycle racks and lockers. 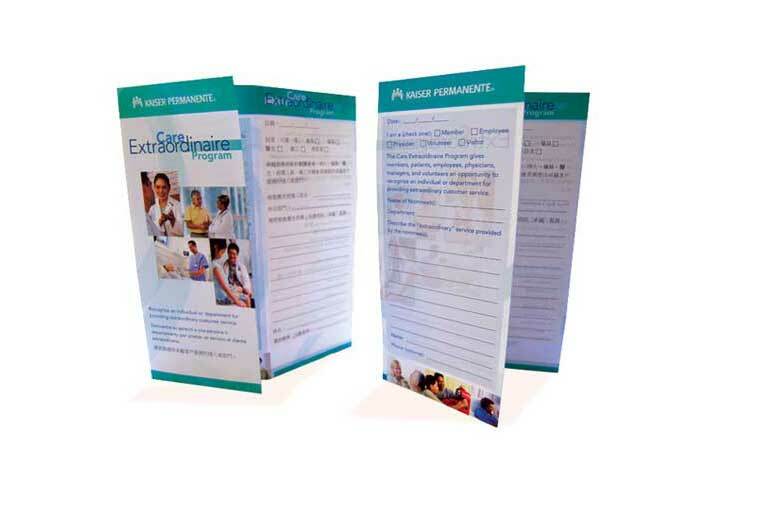 The Kaiser Permanente Baldwin Park Medical Center hired us to create a trilingual brochure for the fold-out of a new program to allow members to recognize an individual or department for providing extraordinary customer service. The brochure is printed in Spanish and Chinese to encourage more patients and their families to use the program. 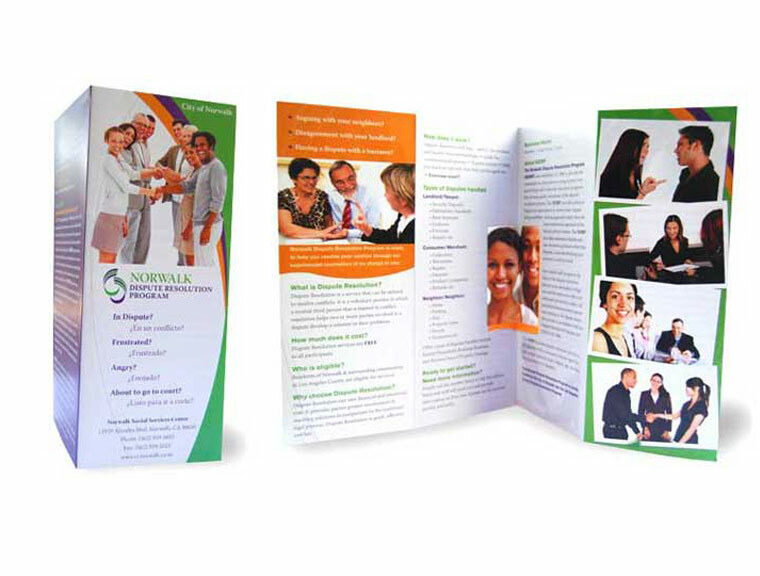 The City of Norwalk asked us to create a colorful brochure to help residents resolve neighborly disputes. The City of Norwalk had a large Spanish-speaking population. As a result, we developed this colorful bilingual publication that included photos showing diversity. We created an inviting design to deal with the touchy issue of disputes. 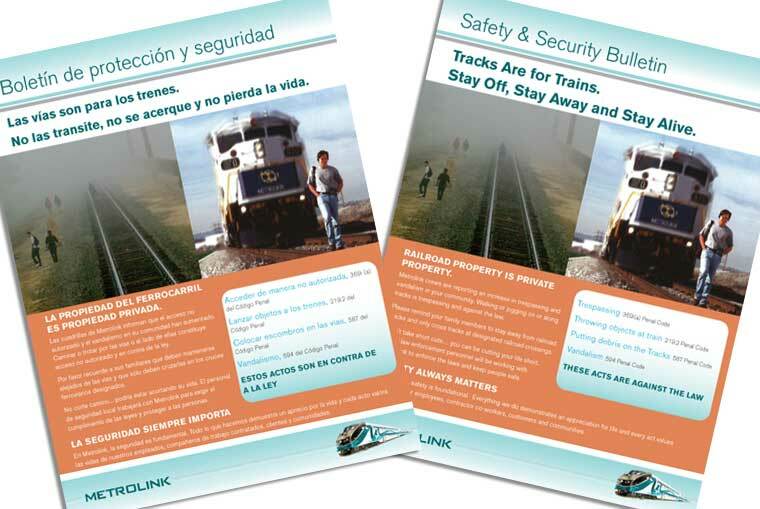 Metrolink asked us to create a safety flyer to be distributed at public schools to help connect with the younger generation. The goal was to educate teens about the importance of refraining from walking on or playing near railroad tracks—quite a dangerous behavior, indeed. This piece was also translated into Spanish. 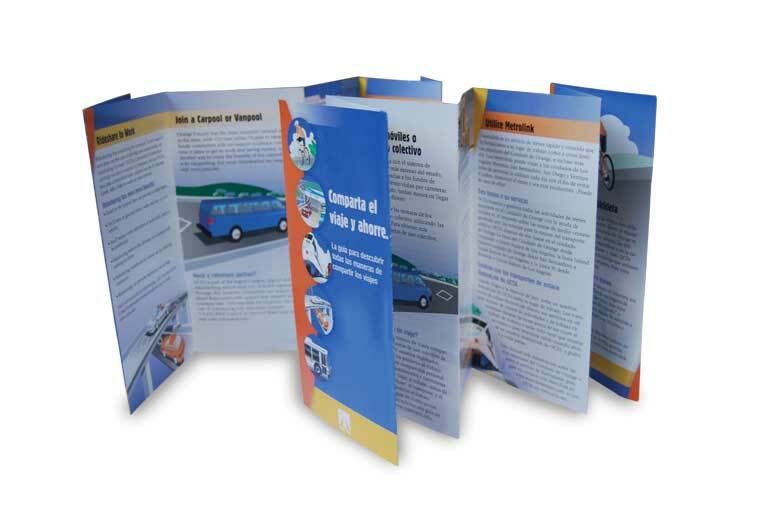 The Orange County Transportation Authority hired us to create a multi-panel accordion-fold brochure to promote rideshare week. The front side was printed in English and the back side was printed in Spanish. For this brochure layout, we created and enhanced colorful illustrations of various commuter transit modes. These graphics were also used for posters and for bus tail wraps. If your company needs a beautifully designed bilingual or trilingual publication that also best represents the local community please contact HWDS at hwdesign@west.net. We provide translation services and have designed bilingual communications for print and online media. Speak the language of your audience! You’ll reach many more people that way. This entry was posted in Bilingual Publications, Uncategorized and tagged Bilingual communications, Bilingual education, Bilingual publications, Diversity, Multilingualism, Park and ride, Spanish, Spanish language, Spanish translation, United States by Successful Corporate Communications. Bookmark the permalink.